When Finn Colton, the Red Ridge police chief, goes undercover as Darby Gage’s fiancé to catch The Groom Killer, his only goal is to close the case. Until he realizes he’s falling in love with his fake bride-to-be! 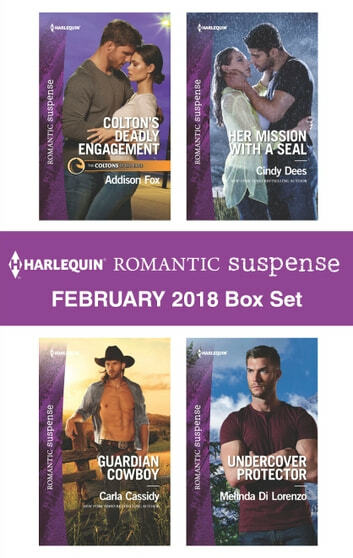 Sawyer Quincy is trying to get to know the woman he’s certain he had a one-night stand with, but someone is going to great lengths to keep him away from Janis Little—and it looks like they’ll even kill to make sure he does! Navy SEAL commander Cole Perriman and CIA analyst Nissa Beck are in a race against time to catch a notorious Russian spy only Nissa can recognize. But with a hurricane bearing down on New Orleans and feelings neither of them expected taking them by surprise, they’ll need to pool all of their skills to succeed—on the mission and in love! A decade ago, Nadine Stuart lost her father and her memory in a fire. Now the man who caused the fire is determined to ensure Nadine never remembers. Her only hope is Detective Anderson Somers, but they must race to find the link between the conspiracy that killed her father and the cold case Anderson is undercover to investigate.